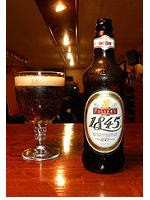 "1845 Celebration Ale is a true landmark in British beer history. Although brewing dates back to 1654 at Griffin Brewery on the banks of the River Thames, the partnership of Fuller, Smith And Turner was formed in 1845. In 1995, to commemorate the company's 150th anniversary, Fuller's commissioned special, celebration bottled ale. 1845 was the result. A more auspicious beginning the brew could not have had; the inaugural beer's hops were added to the copper by none other than HRH Prince of Wales, during a royal visit to Fuller's! Its launch was so successful that 1845 has quickly become the number one bottle conditioned brand in the UK take-home market and is currently the UK market leader among all bottle conditioned beers. 1845 Celebration Ale is a highly acclaimed strong ale and the winner of numerous awards including the CAMRA Champion Bottle Conditioned Beer of Britain (1998-1999 and 2002) and the British Bottle Institute's award for the Best Dressed Bottle (1996). 1845 was also honored with a Silver medal at the 2003 CAMRA Great British Beer Festival in the bottle conditioned beer category." This strong ale pours a dark copper with a one finger off white head. A fine carbonation leaves behind minimal lacing. The aroma is complex with toffee, sweet malt and bread. The taste is also very complex with toffee, malt and some dark fruit. It is a full bodied ale with champagne carbonation and a nice lingering hop finish. This is a great bottled conditioned ale that is very complex. Its a beer I have enjoyed for years and recommend this for anybody looking for a top quality ale that isn't too extreme. I would rate this 9 out of 10.